As 2018 inches to a close, I have the opportunity to reflect again on the events in our wonderful Province this past year. And what a year it has been! We have had two major social functions either end of the calendar – firstly our Burns Weekend at Bournemouth, with all its hugely enjoyable Scottish trappings and in November our End of Year Party – celebrated in Game of Thrones fashion, with one or two hardy souls in costume to out-do the kilts donned at the Burns Event! The January 2019 Burns Weekend is virtually a sell-out, with some 200 Brethren and their partners signed up. If you were intending to apply at the last minute… well, you might just be too late!! I would like to take the opportunity to thank those Brethren who support our social gatherings, which are always highly enjoyable and which raise very respectable sums for charity as a by-product. From a Mark/RAM Masonry perspective this has been a truly remarkable year. The Consecration of three new Mark Lodges and two Royal Ark Mariner Lodges (would have been three of the latter but London’s sewage system scuppered the December Consecration – more of that later). The Founding of a new Lodge is always a special event, as the Founders of Loyalty, Albatross and Ralph Reader Lodges plus Italia and Gallipoli Lodges of Royal Ark Mariners, know only too well. I am sure that you will all want to join with me in wishing those Brethren and their new units every success for the future. The re-scheduled Consecration of Centenary RAM Lodge will take place on Monday 25th February 2019, prior to the Installed Commanders’ Lodge Meeting. Demand for places is bound to be high – so get there early to guarantee yourselves a seat in Grand Temple at MMH! And the story does not end there. Arrangements are now well in hand for the formation of a Mark Lodge for Railwaymen. Any Mark Master Mason who has been connected with the rail industry in any way is invited to become a Founder and meet with friends old and new in an environment where they have more than Masonry in common. As usual, all the info is available on our website (click here). Brethren, I am conscious that alongside the novelty and excitement of the formation of new Lodges, we still have a handful of units where membership is low and where the capacity to introduce candidates and find items of interest for those who attend meetings, proves to be a continued challenge. We have identified those Lodges and I would make a further appeal to the Brethren of London to have a look at this relatively short list, to determine if you have any spare capacity in your busy lives to become Joining Members and bring your undoubted skills and commitment to support these Lodges of Special Opportunity. Please contact myself or my Deputy to discuss matters. Once again visit the website here for further information. Our charities have had a boost during the year from the re-invigoration of the 500 Club, which distributed £2,400 to worthy causes in June – and also an equivalent sum to 5 lucky members/Lodges in our Province. As they say for the Lottery, you have to be in it to win it! More information can be found here. That’s three links I’ve included for the website, Brethren. All that you need to know is incorporated therein. The Webmaster tells me that there is a huge interest in this communication medium and that it receives hundreds of ‘hits’ every week. I hope that you will continue to interrogate it as frequently during the coming year. 2018 has been a whirlwind of activity – large Delegations supporting Official Visits; Consecrations, a Banner Dedication, Provincial Officers’ Mess, DepDCs’ Club Dinner, Grand Master’s LOI Festival in Brighton (supported hugely by London Brethren), Golf Day, exceptionally well regarded charitable giving (yes, those lapel badges!) and much, much more besides – it’s all there to read and view on the website. As many of you will know, the month of December began with a huge challenge, which will not be totally resolved until January. Due to drainage problems (not of MMH’s making) our much admired building at 86 St James’s Street has been unable to offer its usual full range of services and facilities to Lodges. 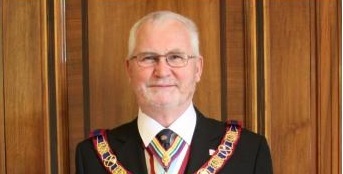 Hopefully the situation will be completely resolved by the time we commence our 2019 programme of meetings and dinners, but in the meantime can I thank those Lodges, Secretaries and members of my Secretariat and Executive who have worked so hard to find ways round the challenges of finding alternative accommodation and dining arrangements. Well done to you all for evincing such spirit, to ensure that our beautiful and important Mark Degree has continued to flourish during this difficult period. Looking further to the future, can I also ask you to note the date of our Annual Meeting – Thursday 11th July. Make sure that event is in your diaries and remind your recently Advanced Brethren, Masters and Commanders, of this splendid afternoon, where they will have a special part to play in their own procession (not to mention a reserved seat in Freemasons’ Hall, Great Queen Street). The Brass Band is booked as normal; there will be the usual investiture ceremony of newly appointed and promoted Provincial Officers, Silver Pin presentations, PGM Awards and much more besides. Full details will be issued early in 2019. On that particularly pleasing note, it’s time now for me to send you all my grateful thanks for your tremendous support of our wonderful and ever-expanding Province and my very best wishes at this special and, for many people, poignant time of the year. Not everyone will spend Christmas in the cheerful way in which the majority of us will – so I ask you to be thoughtful of those less fortunate. Our London Province is made up of Brethren of many faiths, so the members of my Executive join with me in sending you all, the compliments of the Christmas season – however you may celebrate it – and of course our fondest hopes for your continued health, prosperity and happiness in 2019. Looking forward to meeting and being with you again in the New Year.